Although Oh My Veggies is a vegetarian food blog, we know that most of our readers aren’t strict vegetarians—instead, they’re either looking to cut down on their meat consumption or looking for recipe ideas to make for friends and family that don’t eat meat. We no longer live in a time where meat is the centerpiece of every meal as more and more people take a flexitarian approach to eating. I love this because as flexitarianism becomes mainstream, it makes things easier for those of us who abstain from meat entirely too—almost every restaurant has vegetarian options these days and even small town grocery stores stock things like tofu and veggie burgers. Vegan Vegetarian Omnivore by Anna Thomas is a cookbook that particularly resonates with me, as there are vegans, vegetarians, and omnivores in my extended family and it seems like every holiday, we’re faced with questions about what everyone can and will eat. This cookbook has the answer! It presents menus for both everyday meals and holiday celebrations, with recipes that will please everyone at the table. While there are meat recipes in the book, the majority of the recipes are vegetarian. While entertaining is a big component of Vegan Vegetarian Omnivore, I found that many of the recipes work for weeknight dinners as well. Although this Cannellini and Garlic Spread is technically an appetizer, we used it as part of a meze platter dinner, with crostini, kalamata olives, sun-dried tomatoes, caramelized onion jam, cheese and arugula. Cannellini beans whip up smoother and creamier than chickpeas; lemon and herbs add fresh flavor that balances the pungent garlic. Like all the recipes in this cookbook, this spread is a crowd-pleaser. Recipes and images from Vegan Vegetarian Omnivore by Anna Thomas. Copyright © 2016 by Independent Productions, Inc. With permission of the publisher, W. W. Norton & Company, Inc. All rights reserved. Put the garlic cloves in the food processor and pulse until finely chopped. Add the remaining ingredients and pulse until smooth, or until the spread has the texture you like. If it seems too thick, you can add a few tablespoons of the cooking liquid from the beans or a dash of vegetable broth. Serve the spread in a generous, shallow bowl and pour a few loops of olive oil on top, then sprinkle with some oregano leaves. This spread also makes a great layer for wraps or sandwiches. To Cook Cannellini... In a soup pot, combine 1 1/4 cups dried cannellini beans with about 2 quarts water, a dozen sage leaves, and 6 to 8 whole peeled garlic cloves. Bring to a boil, then lower the heat and simmer the beans for an hour or longer, depending on their age, until they are completely tender. Add 1 teaspoon salt and simmer gently for another 10 minutes, then allow the beans to sit in their liquid for a little while before draining them. Reserve the liquid to use in a soup—it’s a delicious broth. I love this! 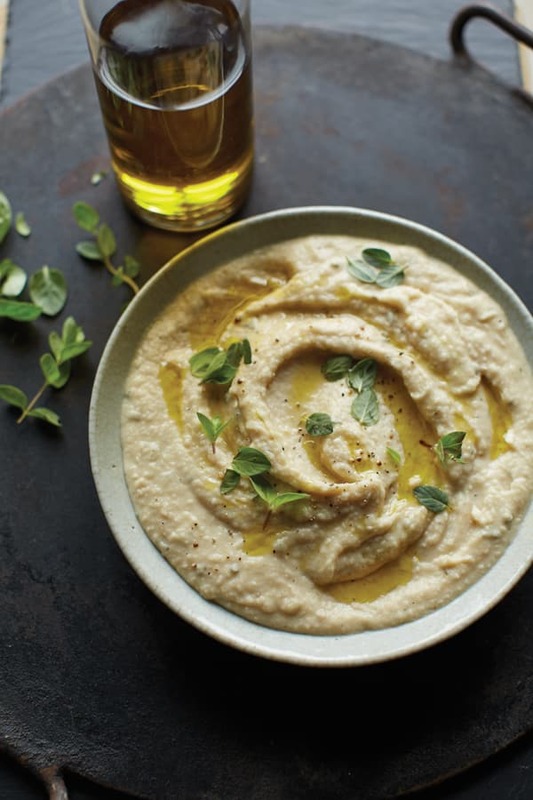 My daughter is allergic to chickpeas and can’t eat the traditional hummus, so, I’m looking forward to making this for her… and me!